Root is generally non green (do not contains chlorophyll) underground, positively geotrophic (grow towards the gravity), positively hydrotrophic (grow towards the source of water), negatively phototropic (grow opposite to the source of light) part of plants. Roots do not contain any nodes, internodes, leaves, lowers and fruits. Buds are absent except when roots take part in vegetative propagation. This type of example can be seen in Ipomoea batatas,Dalbergia, Populous, Dahlia etc. 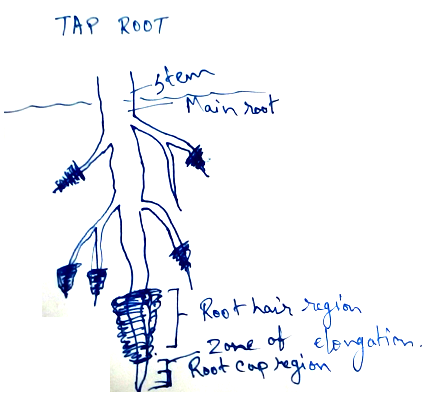 Structure of root- Root consists of root cap, root hairs which are fine thread like (in subapical region). Root branches are endogenous in origin (developing from the pericycle in between two protoxylem points). Parts of the roots - In a typical root, there are five distinctive zones starting from apex to the base. 1. Root cap - It is a cap like covering over the tip of the root which gives protection against friction and weir and tear from soil particles. Root cap also help in graviperception. In different situations root caps are modified to give protection. In aquatic plants root pockets are observed instead of root cap because they are nonrenewable and act as balancers. 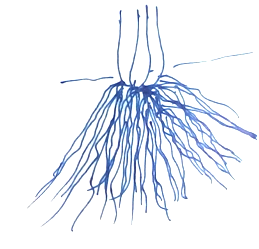 Multiple root cap is observed in the aerial root of different plants. Example is Pandanus. 2. Growing point of root - It is found in the long region of meristematic cells which is almost 1 mm long. This growing part produces new cells for root cap and basal part. 3. Zone of elongation - It is behind the tip which is 4-8 mm long. As it is responsible for the elongation of root so, cells of this area elongated rapidly. 4. Root hair zone - This area is a cell maturation zone. Thus, xylem and phloem differentiated here. The region is 1-6 cm long. For increasing absorptive area outer cell give rise to tubular root hairs. 5. Zone of mature cells - Bulk of root is made of it. 1. It helps the plant body to remain fixed with the soil. 2. One of the essential thing is water for plants and dissolved nutrients are transported with the help of root. 3. Water and dissolved minerals make a continuous water column through root by xylem and help in uptake by the plant. 4. Roots prevent soil erosionas it holds the loose soil tight. 5. Only source of nitrogenous salt are absorbed by the root which is very essential for plants. Root acts as - store house of food for plants, reproductive organ, pillar for plant, supportive part of plant, climbers etc. 1. 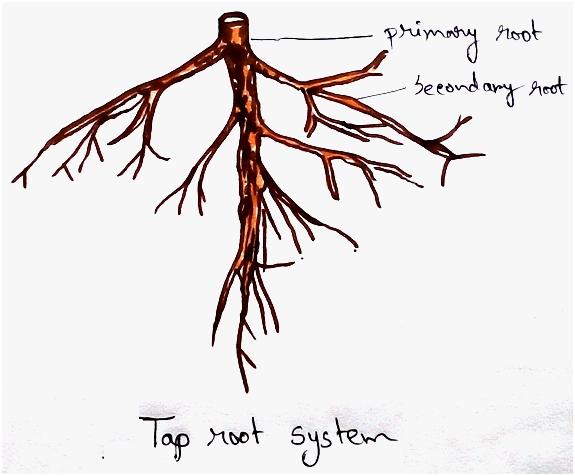 Tap root system - It is a complex of roots formed by tap root and different types of branches borne by it. E.g. mango, peepal. 2. 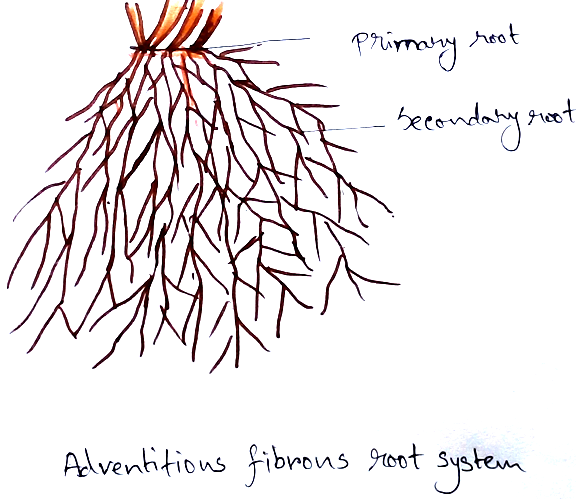 Adventitious root system – It is a complexed formed by roots that develop from the parts of the plant other than primary root or its branches. It can develop from any part of the plant.